This week I visited Witch’s Woods, which is more than a Halloween haunted house, giving it 5 stars in my full review. 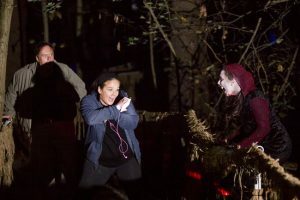 It’s a giant destination within an hour’s drive of Boston that you can really spend all night in, with carnival rides, seven haunted attractions, performers, and a real sit-down restaurant and bar. 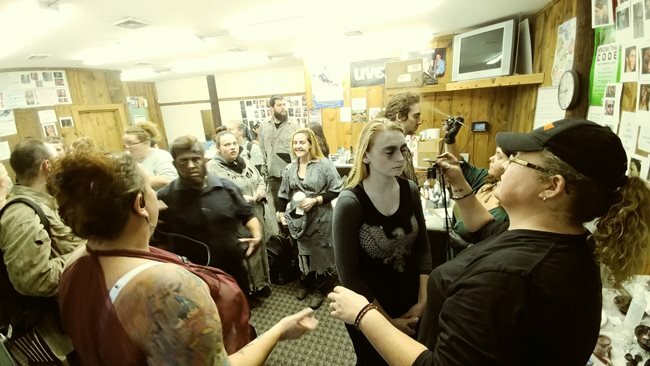 I got some shots in the makeup tent as actors prepared to be monsters, and managers Pam Fletcher and Brian Brandt kindly agreed to an interview. Events INSIDER: This close to the city, most of the Halloween attractions are in malls and warehouses — very urban. But you’ve got a beautiful setting here. Events INSIDER: There’s also a lot to do, right? You can spend an entire evening here. Brian Brandt: Easily. We’ve got six ticketed attractions. We’ve got the Pumpkin Jamboree and Horrorwood that don’t require a ticket, with scenes from horror movies. It’s a good way to test out the little ones [ about whether they’re comfortable to enter the park; Witch’s Woods is family oriented and accepts brave kids as young as six. ]. Brian Brandt: We do have a stage show as well. If we’re busy enough where we get a good crowd, we do dance-offs, guitar, an air guitar competition. We have fire spinners too. And fireworks, usually one of two different days. I think it’s the Saturday before Halloween. There’s a huge costume party up here and there’s fireworks right over there. Events INSIDER: What do you proudest of that you want readers to know about? Brian Brandt: Dedicated crew. I can’t do any of this without them. 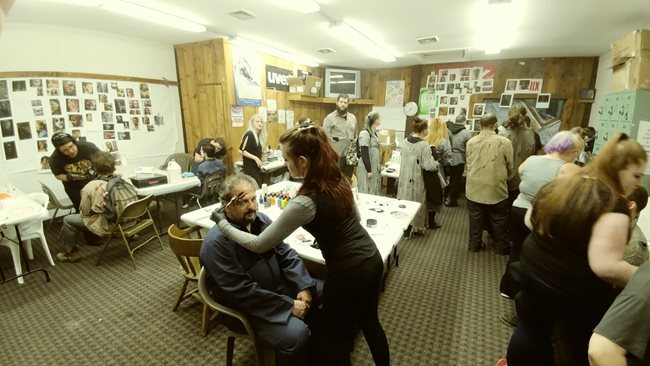 They basically surrender five weekends of their lives to come in, many of them every night on top of full time jobs with overtime that they are doing on their own time. Events INSIDER: Do you have a charity that you work with? Pam Fletcher: We do a big fundraiser for Dana Farber in the winter. We do a big thing for the Jimmy Fund. In the winter time. It’s a skiing event. Pam Fletcher: I would say that all of Nashoba Valley is very generous with donations to fundraisers. Pam Fletcher: We are constantly giving away tickets, not only for this, but for skis and skiing. Pam Fletcher: Yeah and it’s fun because it gives them a unique thing to bid on. It raises money for a charitable event and or for a valuable cause. We try to do as much of that as we can, especially local. Pam Fletcher: And the Make-a-Wish foundation, they bring a bunch of people and they have an experience, they go to Witch’s Woods and have a wonderful experience. Brian Brandt: And they don’t have to wait in line for the hayride. Pam Fletcher: We tout ourselves as having New England’s longest hayride, one of our signature attractions over the years. It’s about 17, 17 and a half minutes. Pam Fletcher: The other thing that we’re really excited about, we opened it last year, is the Vampire Passage, because it’s just so different. It’s a walk in the woods. It’s creepy. Events INSIDER: Thank you for your time!